Most of the smartphone manufacturers are busy to make similar designs of smartphones: narrow bezels, large screen, sharp display, and thinnest casing. Todays’ smartphones are too big, people find difficulty in using them with one hand. If you are also sick off from large smartphones, so this smartphone is for you. 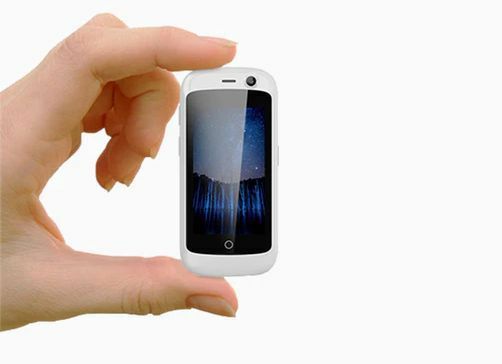 The Unihertz company has recently astonished the world by announcing a world’s smallest smartphone, dubbed as Jelly. Apart from the smallest phone, there is also a pocket size flying camera which launched recently, you can review its specs and features through VogaTech. Jelly is the smallest smartphone just 2.5 inch in size and carries the support for 240 × 432 pixel resolutions, and running on the latest generation Android Nougat operating system out of the box, sounds interesting. Despite its size, the smartphone possesses decent features and specification. The Jelly smartphone will available in two versions, the base version or pro variant. Both models are powered by the Cortex A53 quad core processor clocking at 1.1 GHz. The base model of the smartphone will come with 1GB of RAM along with 8GB of internal storage capacity, while the Pro variant will pack the 2GB of RAM along with 16GB of built-in storage. The phone also supports the MicroSD card for boasting storage up to 32GB. As far as the camera is concerned, the phone will come with an 8 megapixel rear camera and on the front, there is a 2 megapixel front snapper. Another interesting thing, the smallest phone will come with the support for 4G connectivity and sports two nano SIM card. Other connectivity options include GPS connectivity, Wi-Fi, and also support Bluetooth. To power the phone, there is a 950mAh battery buried inside. The company claims that the 950mAh battery will provide enough juice to last for at least three days. The phone will available for purchase in August and will priced at $109 for the base model, and $125 for the Pro model.